Our LOL fans have been very busy and creative!! 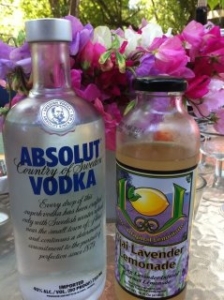 Andre of Ojai has paired Vodka and Ojai Lavender Lemonade for a refreshing Lemon Drop Cooler! With the intense flavor from the pure organic fresh squeezed lemon juice and the organic sugar from Brazil in addition to the hint of our infusion of Lavender we have fans creating all kinds of unique and refreshing combinations in their favorite mixed drinks. We are too! While I am training for the Ironman, Arizona 2012, I am closely monitoring everything I eat and drink! I love to add mint tea or sparkling water to my LOL, pour it over ice with a slice of lemon to make a really good, refreshing and light LOL. We like the idea of diluting as opposed to adding artificial sweeteners. You still have the nice lemon and lavender with half the calories! Send us your favorite recipe and enter to win an LOL Tshirt!